At every show we attend, Audio Note UK follow the same MO of big signs with model name and price prominently in view. 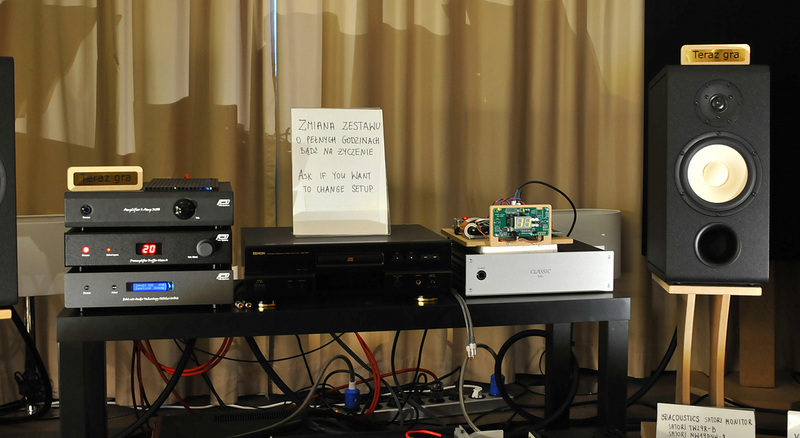 Wojchiec Szemis who imports the gear followed suit with an OTO SE integrated amplifier, DAC 2.1x converter and AN-E corner-loaded loudspeakers. When we visited, some adjustments were still needed to get the sound locked in. Then came a name to remember: Audio Alto of Ljubljana in Slovenia, with Saša Burian the owner and designer. Next to various tube electronics like the Anniversary 10 dual mono preamplifier and MMC3H media player, he had the LA17 OB MkII active loudspeaker system playing though sound projector would be a more accurate descriptor because the system consists of a woofer cabinet with a very narrow but tall and curved rib above. Said rib is the dipole non-baffle for 15 x Alpair alloy-coned widebanders. Moreover, the woofer cabinet is actually an isobaric ripole. In its role as a virtual sound projector, the sweet spot was a remarkably wide very enveloping zone. To fine-tune this, the curved beam can be separately toed in from the woofer cab. It was amazing to hear how much height information the music signal actually embeds once that signal projects from a curved line source. How about phase and time alignment? In conventional speakers, much effort is spent to deliver the sound on time and in phase to routinely mean an angled baffle. Audio Alto exploit some DSP instead and use widebanders to begin with. This speaker comes in two versions – fully active with 2 x 400w for the bass and rib respectively; and part active with only the bass system powered. 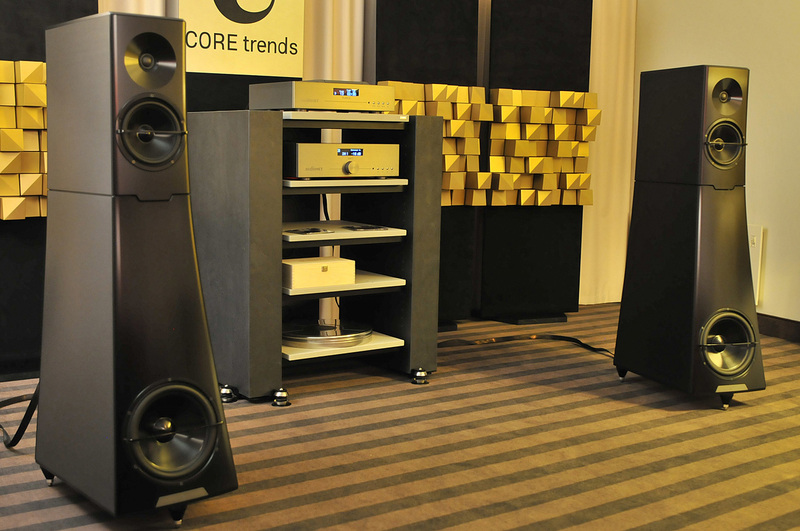 Looking back at the show with the wisdom of hindsight, for us the Audio Alto room was the most surprising and innovative in Warsaw this year. Hence a review is already booked. 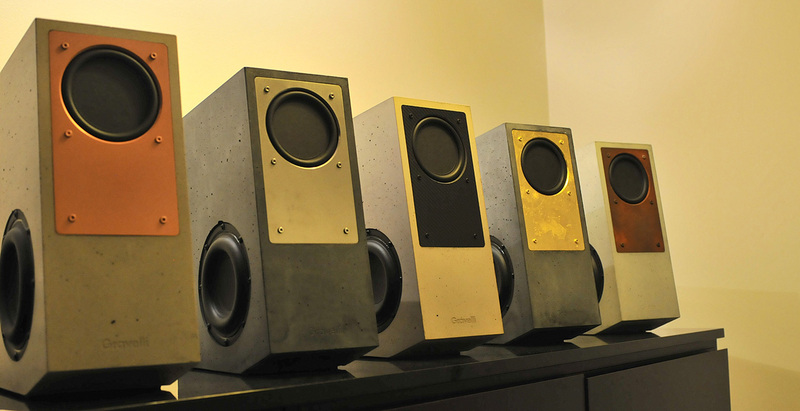 Gravelli Bespoke Audio are a Czech company of active loudspeakers in concrete. Actually, concrete is too generic a term as their enclosures use a polymer/concrete sandwich. Their first model is an active 3-driver 2-way with compact dimensions of 38 x 28 x 15cm weighing in at a stout 16kg. The mid/tweeter is a flat bending-wave affair aka balanced mode radiator or BMR with very wide dispersion to explode the usually narrow sweet spot. Two 100-watt Hypex modules power the widebander and 5" woofer respectively whilst a passive 7" radiator opposes the latter to augment reach to 40Hz. As expected, this a master/slave affair whose master adds an LCD panel below its BMR. While the speaker was compact, it packed interesting technology, offered multiple digital and analog inputs and various concrete colour options. 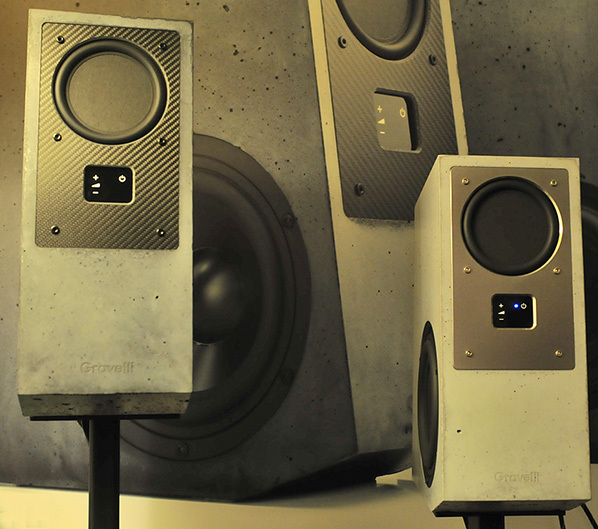 The material's air bubbles left after the casting process is complete gave this speaker a very industrial look. Entering the next room met us with a smile from Martin Gately of soundkaos, creative spirit behind innovative Swiss designs. When we entered, the dipole Libération filled the room with some Alan Taylor. Amplifiers in double stereo were the new Bakoon AMP-13R. With 25wpc each facing the Libération's 96dB sensitivity, that was ample power. After the Taylor tracks, we were treated to some Hadouk Trio. It demonstrated the copious SPL capabilities of this open baffle. At some point, Martin switched to his new Vox 3 stand mount. We deliberately wrote stand mount because in our view, monitors are designed for the nearfield with a thus more directional character. The Vox 3 is different. Yes there is a front-facing 4" widebander like a monitor might use. But there are also two 5" sidefiring woofers breathing through a rear vent which asks for some listening distance. Then the Vox 3 is topped off with a ceiling-facing Raal ribbon super tweeter. With the Vox 3 taking over air excitation duties of the room, our brains needed some adjustment. The massive yet open Libération sound had to be cleared from our aural cache to make space for the new sensation. That was more intimate and lighter to the touch – no surprise when it was a small-driver vented box, not big-driver dipole. After a minute of adaptation, the similarities in character became clear. Martin then switched back and forth between 'big' and 'small' a few times to confirm our perceived family ties. Mind you, the Vox 3 still weren't final. Martin was waiting on an AlNiCo version of his widebander. We saw some photos on the laptop. No doubt this was one of those rare 'reboot' rooms we mentioned in our intro. 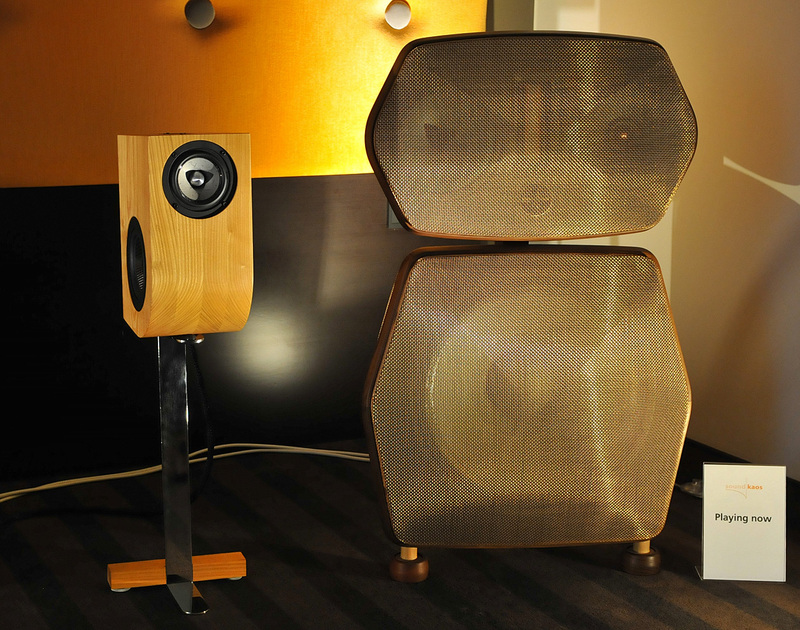 A pair of YG Acoustics Hailey 1.2 loudspeakers fronted a German Audionet Planck CD player and 165wpc Watt integrated. At first glance, the combination of expensive Hailey and plain Audionet gear could raise eyebrows as in, could it possibly match? YG rate their speaker at 87dB sensitivity so an amplifier needs to contribute some power to wake things up. From what we heard, this combination sounded clear, dynamic and under full control. While the German electronics may seem simple, they actually rank amongst the very best that country offers in hifi technology. 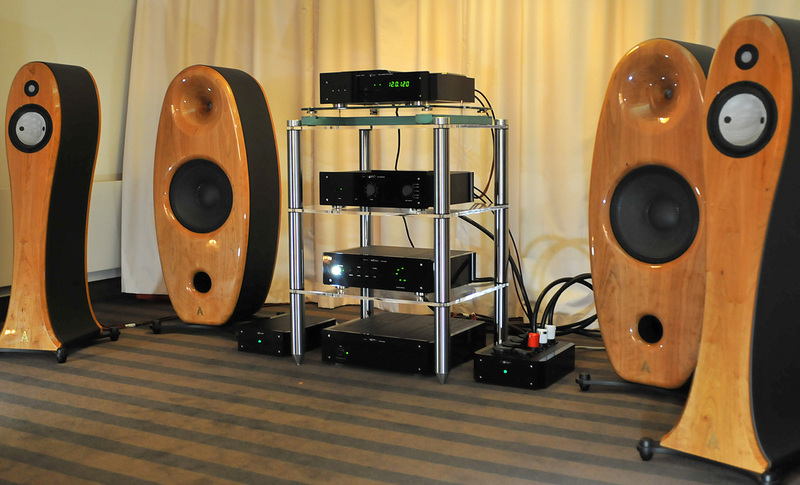 In other words, a very good combination of loudspeakers, source and amplification. Lector are an Italian company started in 1982. 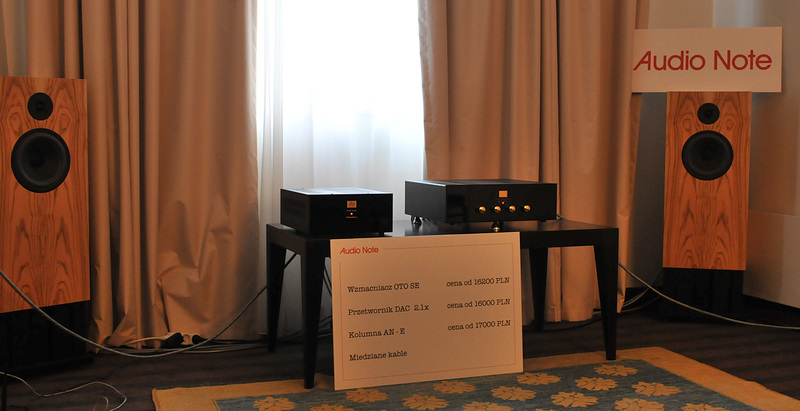 We listened to their CDP-7T-MkIII CD player with class A tube outputs and separate PSU-3T power supply, Zoe tube preamplifier and VM-200 tube/Mosfet hybrid power amp. Loudspeakers were by Aida Acoustics. The larger oval Thaisis was on passive display during our visit while Galatea did the hard lifting. This was a ported 2-way for a claimed 37Hz to 25kHz at -6dB. For our tastes the sound was a bit too 'Accuton', that is on the bright side. 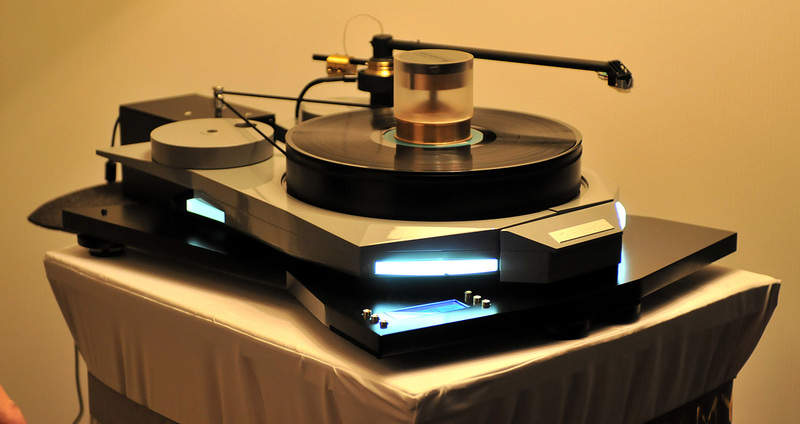 Polish turntable manufacturer Tentogra turned out big this year. Their Oscar is really large and 92.5kg massive. Add the table beneath it and the needle pegs 160kg. But that table can still be filled with sand for even more stability and vibration resistance. And that's the holy grail of Tentogra. Think magnetic damping in the footers, a special base composed of layers of wood bonded under high pressure and "filled with 130 pneumatic elements" plus high inertia from sheer mass. Other negative influences are battled by creating a Faraday cage around the motor controller and running the motor off a high-capacity battery. Tone arms of choice were Kuzma as were the cartridges. Loudspeakers were Cabasse Adriatis Evolution 600 while amplification was by Idhos and Sky Audio. In the back the brand-new Tentogra Gramy showed a somewhat more conventional shape and size. 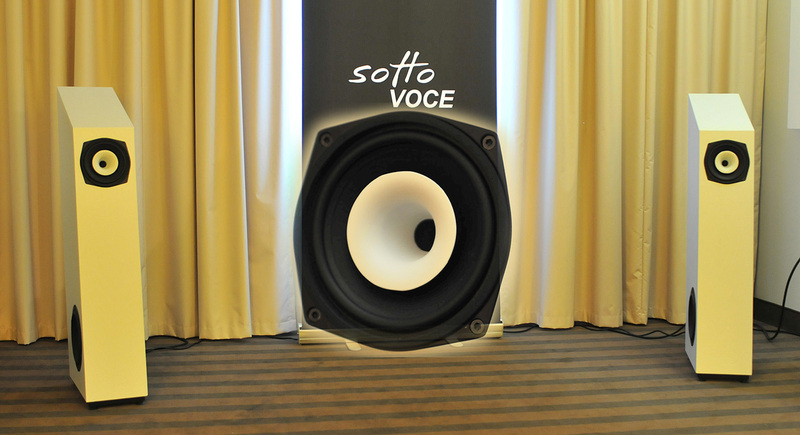 Sottovoce are based in Spain's Valencia and premiered their active Stereo 3 3-way. The central action came from a 165mm broadband coax with neodymium motor and 40mm compression tweeter. Two sidefiring 200mm woofers sat close to the floor. Amplification was by built-in 400w class D. Rated bandwidth was 47Hz to 19kHz. From the short listening session we flashed on the Cube Audio sound where the mids and upper frequencies were concerned. We also liked the visual presentation: just two speakers and no clutter. No sooner had we said 'no clutter' that we came upon a room loaded for bear with electronics, loudspeakers, name and price tags and above all a very present backdrop picture. Add the striped carpeting and bingo. This was the Manron room. This father/son firm focuses on tube amplifiers and loudspeakers from Toru? as their Polish home town. Their proof of concept was a single giant mono amp built around the enormous GM100 tube, hence its demo consisted of just turning it on to emit photons on the order of making a small light house jealous. More practical just then were the other amplifiers. The company offer a very wide range of integrated and stereo/mono amps with all kinds of tubes. Featured were the new Delta PP20i with KT66 and Delta SE 100pa with GU48. Just as interesting were the loudspeakers, basically the one Lambda model where the customer has a wide choice of configuring exact ingredients. There is a top-vented bass module with a docking midrange cabinet that can rotate for toe-in. On top of that is room for the tweeter module. 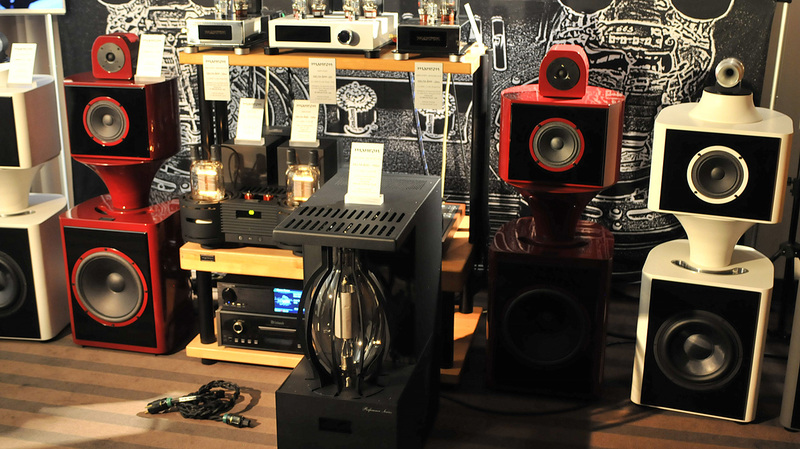 What to do if your budget lags behind your audiophile ambitions? If you have two more-or-less right hands, go DIY. 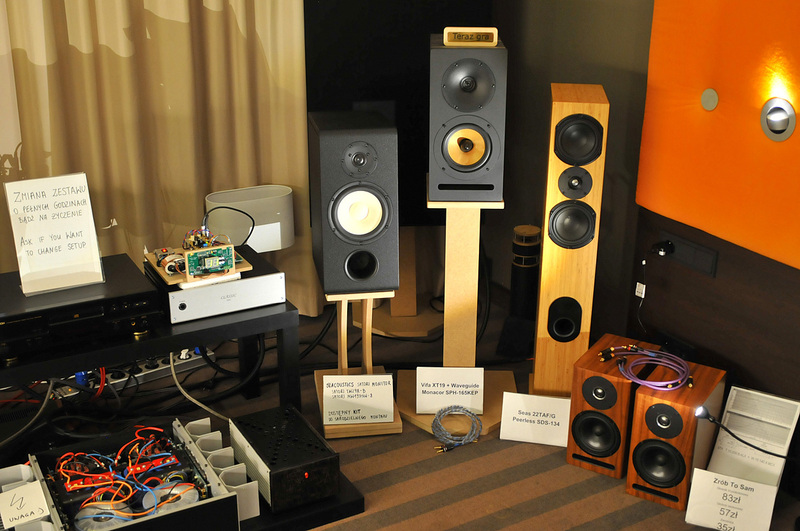 Each year, we visit the DIYaudio.pl room to see what new 'inspired by' equipment we might enjoy. These DIY products are non-commercial so more a tribute than knock-off. This year we listened with pleasure to a set of loudspeakers with wave-guided Vifa XT19 tweeter and and Monacor SPH-165KEP woofer. Its pleasant sound was no surprise once we realized who built it: Krzysztof Lusztak, better known as Doctor and a member of the Pancin Art Technology team whose VZ1 loudspeakers we'd reviewed back in 2013. That made it a nice meeting again.